With less than one day to go before we left home to drive to Sydney for the 2013 City2Surf race, I decided it would be a good time to sew up a new pair of leggings. Never mind that we were going to be out all evening and leaving mid-morning the next day, there’s always time to sew, right? These leggings are made from Supplex French Terry, with an insert of a dance lycra fabric (not sold here) on the outside of the legs. This time around, I added a back zip pocket to the leggings. It was quite simple to do and very useful. The only thing I did wrong was to insert the pocket too low. You can see in the photo below that it’s just above my derierre, rather than on my back. As long as I’m only carrying flat items such a driver’s license, Parkrun barcode or money notes it will be fine. If I want to carry keys or even my phone it’s going to look strange and feel even stranger. I’ve already altered my pattern pieces and template for future pockets, so the zip will sit just under the waist elastic. Live and learn. 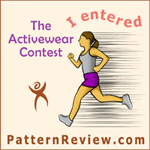 The Papercut Ooh La Leggings pattern is actually a fashion garment, that lends itself brilliantly to sportswear. I’ve made four pairs of these leggings now and wear them in preference to any of my purchased leggings. They can be made on an ordinary sewing machine, although I did use an overlocker for the seaming on these. Comments: These leggings were amazingly comfortable to walk/run in and extremely warm. Need to insert the zip pocket higher next time. Quickie Race Report – due to a Grade 2 Calf Tear in my left leg six weeks ago, my physio has forbade me from running but said I could walk the City2Surf. All 14km of it. So I walked it in 2 hours, 6 minutes and 10 seconds. Ok, I did run a little bit – the last 700 metres of the race. I was feeling quite good at that point, nothing was hurting, so I decided to run a short distance. I had intended it to be only 200 metres, but misjudged the location of the Finish. Below is one of my official finish photo’s, I find it amusing that the only photo’s of me in this race are of the very last run at the end!